In times when most retailers are delivering dismal performance, this exceptional player is obliterating the competition. The retail industry is going through a particularly challenging period, and most companies in the sector are delivering dismal sales figures. However, in a time when most competitors are struggling, TJX (NYSE:TJX) looks stronger than ever, and this says a lot about the company and its management team. When looking at department stores and retailers focused on apparel, things seem quite gloomy. Consumer spending in fashion and apparel has been remarkably weak lately, and brick-and-mortar retailers are facing daunting competition from online players. Many companies in the business are delivering stagnant and even declining sales figures. Macy's (NYSE:M) announced a 7.4% decline in revenue during the first quarter of fiscal 2016. This was driven by the impact of 41 store closings and a 5.6% decrease in comparable-store sales during the quarter. Total revenue at J.C. Penney (NYSE:JCP) was down by 1.6% during the quarter ending April 30, while comparable-store sales declined 0.4%. Sears (NASDAQOTH:SHLDQ) announced a decline of 9.9% in total revenue for the quarter ending Jan. 30, while comparable-store sales at Kmart and Sears Domestic declined by 7.2% and 6.9% respectively. Total sales at Gap Inc. (NYSE:GPS) fell 6% during the first quarter of 2016, with comparable sales declining by 5%. Comparable sales from The Gap brand fell 3%, Banana Republic declined 11%, and Old Navy registered a 6% decline in comparable-store sales. When a wide variety of companies in a particular sector are reporting declining sales, you know the industry is going through difficult times, since disappointing performance across the board can't be attributed to a single company and its mistakes in areas such as merchandising or competitive strategy. You wouldn't have guessed that by looking at TJX, though. The company reported $7.5 billion in sales during the quarter ending April 30; this represents a vigorous increase of 10% in total revenue, while comparable-store sales grew 7%. Importantly, growth was broad-based, with the company's different business segments delivering healthy increases in comparable sales. The Marmaxx segment, which is a combination of Marshalls and T.J. Maxx, grew 6%; comparable sales at HomeGoods increased 9%; TJX Canada delivered a 14% increase in comparable sales; and TJX International reported a 4% jump during the quarter. Last quarter was not an exception. 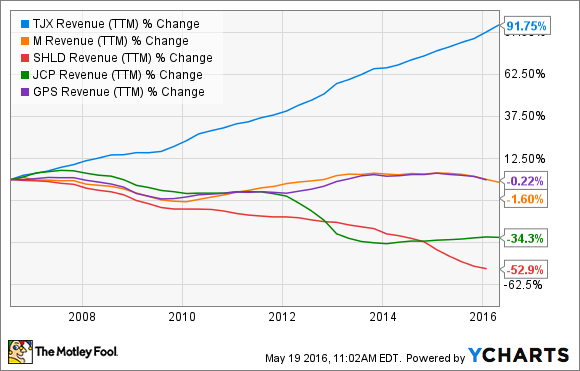 The following chart compares revenue growth for TJX versus Macy's, J.C. Penney, Sears, and Gap Inc. over the last decade. The difference is quite staggering: Sears and J.C. Penney have experienced major contractions, while Macy's and Gap Inc. are mostly stagnant. TJX, on the other hand, has delivered consistent sales growth in the last ten years. TJX Revenue (TTM) data by YCharts. Not only did TJX deliver impressive financial performance for the first quarter of 2016, but management also increased both sales and earnings guidance for the full year. According to the company's internal research, traffic increases are being driven by both new customers and existing customers shopping more frequently at the company's stores, and this bodes well for the business in terms of customer engagement. Management is planning to encourage more frequent visits and cross-shopping at the company's chains by strengthening its loyalty programs. This sounds like a smart strategy to drive sustained growth, and also to consolidate TJX's competitive position in an increasingly challenging retail industry. Most industry operators are aggressively focused on e-commerce nowadays, but TJX is taking a different approach in this key area. E-commerce is relatively small for TJX, and management wants to grow that segment methodically to make sure that online platforms play a complementary role, as opposed to cannibalizing sales at physical locations. In a time when most competitors are reducing store counts to protect profitability and stabilize sales at existing locations, TJX is broadening its presence across the world. The company plans to open 195 new stores in 2016, a 5% increase in the store count versus 2015. Management is not planning to close any stores in 2016, which indicates that the company has been widely successful at opening new stores in the last several years. Over the long term, management believes it has enough room for 5,600 stores, including current concepts and current markets alone. This represents almost 2,000 store openings, or a huge increase of over 35% versus the current 3,614 stores it had as of the end of last quarter. These growth estimates don't even account for possible expansion into additional countries, or opening new chains in existing markets. The company has been successfully expanding into countries such as Austria, the Netherlands, and Australia, so management is proving that it knows how to replicate TJX´s winning strategy across different markets. Even a mediocre company can do well when the wind is at its back, but TJX is producing impressive performance in times when the competition is struggling, and the business looks stronger than ever going forward. It's only fair to say that TJX is an exceptional player in the challenging retail industry. Is TJX Companies a Buy?